Recorded on December 23, 2013. 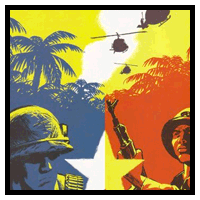 The parallel stories of an American soldier, PFC Bill Everette, and a North Vietnamese soldier, Vo Binh Dai, as they join their respective armies during The Vietnam War. As they fight for their countries, the horror of the war wears upon their soul and sanity. Jason: You can buy pre-made spanakopita at Trader Joe’s. I don’t know if it’s any good. Eric: Interestingly enough, at 1:17:36 of GutterTrash Episode 85 (Bring Me the Head of Alfredo Garcia) you say “There’s a Greek thing that I really like. I don’t know what it’s called, but I know what’s in it.” You then go on to describe spanakopita. 176 episodes later, things have come full circle. I am genuinely frightened that you know the exact episode, let alone the timecode that I talked about, well, anything.